Glengarry’s Sunday ramblings of all things vinous, grain and glorious. 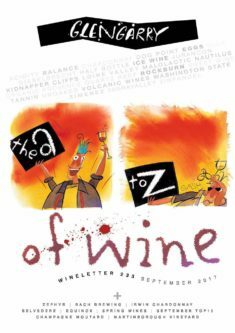 Issue 9, The A – Z of wine. Goodbye Winter. Can’t say we’re sorry to see the back of you, what with the wind and the rain and the flu; when all’s said and done, there’s only so much a warming glass of red wine will fix. However, we turn our gaze and our palates to the more benign months with a glowing shimmer of anticipation. It’s reboot and refresh time, and what better way to kick things off than with a quick A-Z of things vinous for your general edification. From A for acidity to Z for Zinfandel, there’s bound to be a little bit of something in there to intrigue and interest many of you. What else? We feature Zephyr wines, the appropriately-named vehicle for the impressive winemaking skills of Ben Glover. Bach Brewing, only three years old but already so weighted down with medals. An exciting new offering from Gisborne’s Matawhero winery, the Irwin Chardonnay. Belvedere vodka – Polish know-how 600 years in the making. The under-the-radar genius of Champagne Moutard. Stonecroft is a small, family owned winery making organic Gimblett Gravels wines in Hawke’s Bay, New Zealand. The owners are Dermot McCollum and Andria Monin, who live on the Roy’s Hill vineyard with their two children Emer and Oscar, plus Jasper the cat and Stanley the chocolate lab. At Stonecroft, they seek to express through their wines the unique character of their vineyards and each vintage. The intention is to make wines which are intense, full-bodied, elegant and fruit-driven, but capable of significant bottle development. The ability of the wines to improve in the bottle has been demonstrated over more than 20 years, with many of the early examples still drinking well. Their total production is very small; with around 3,500 cases produced annually. Both the vineyards and the winery are certified organic. Andria will be presenting on the night. A tasting not to be missed. More next month. Jonathan Hamlet, chairman of Organic Winegrowers New Zealand, said up till now many producers had not bothered to market their wine as organic because the process was too difficult. 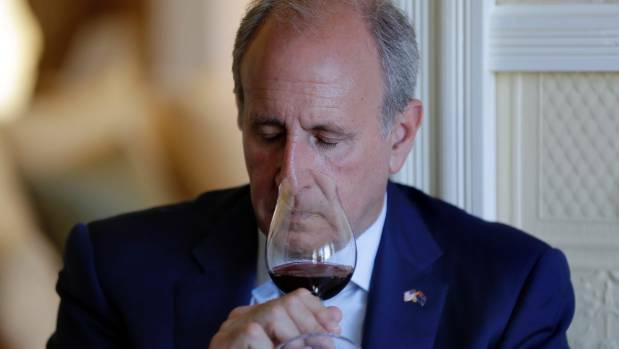 “We used to have a lot of red tape, it involved getting an individual importing licence for an individual market, not one for the whole of the EU, but in last two years the Ministry for Primary Industries and NZ Wine have been working towards getting equivalence,” Hamlet said. 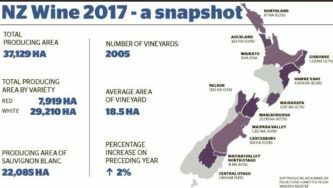 In 2013, almost 2000 hectares (5.6 per cent) of New Zealand’s 35,700ha wine-producing area were under organic certification. The total value of organic wine exported is estimated to be $44 million. 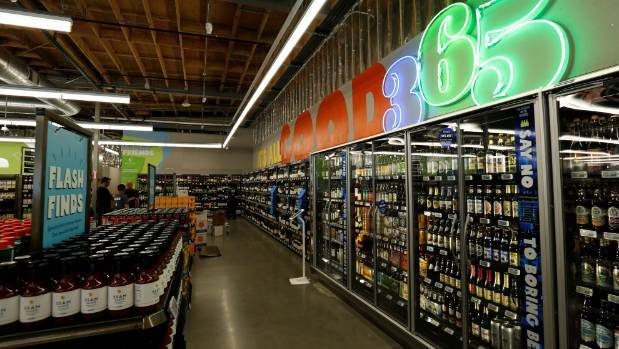 The organic wine industry has a goal to reach 20 per cent of New Zealand production by 2020. Millton said it was an achievable goal because many producers already practised as organic but did not undergo the certification process. “It’s just a question whether these growers are prepared to undergo certification. If they do I’m confident we’ll get to 20 per cent by 2020.” He said his main wine varieties were chenin blanc, viognier, riesling and chardonnay. One of New Zealand’s biggest wine producers, Villa Maria, was just under 30 per cent certified organic. Hamlet said there was a three-year conversion process from non-organic to certified organic and an annual audit which ensured a grower complied with organic standards. Organic manufacturers could use sulphites, which are natural preservatives, to stop wine oxidising, although they are used at lower concentrations in organic wines. New Zealand has similar organic equivalence agreements with Japan, Switzerland, Taiwan and the US. This meeting was excellent with Jonathan (Jono) Hamlet being an interesting and enthusiastic speaker concentrating on the organic viticulture rather than the wine. It was a very informative balanced presentation, leading to a good level of orders. A good follow up with the newspaper item included in the newsletter. To recap, the wines presented included; a Gerwurtz quaffer, then two wines from the Private Bin range, two Cellar Selections and two single vineyard wines, all organic offerings. In order to show some more ‘interesting’ varieties, Jono arranged for some barrel samples of wines produced from grapes from their organic vineyards ie Chenin Blanc. A good tasting, could be interesting to follow up at a later date to follow the development of organic wines. Interesting that only a week after Jono Hamlet spoke at our October meeting the item included on this site ‘In the News – Oct 2014‘ appeared in the Dominion Post. Clearly organic production is getting increasing attention. See Organic Vineyards & Wineries. Looking forward our December dinner at Strawberry Fare, and a great price has been negotiated. Download the payment advice form for the November and December events. Either pay online or bring the form with you when you come to the November tasting. We are anticipating the usual strong support for these events. We were also be treated to some more interesting varieties from some of the 15 varieties of ‘barrel samples’ produced across the Hawkes Bay. We won’t be tasting them all on the night but these will provide us with an interesting wine experience. Jono plays an integral part in managing Villa Maria’s 65 hectare Joseph Soler Vineyard in the Hawkes Bay, 21 hectares of which are fully certified with BioGro. His role involves the challenge of managing the vineyards organically, while meeting the economic and quality parameters set out by the company and industry. 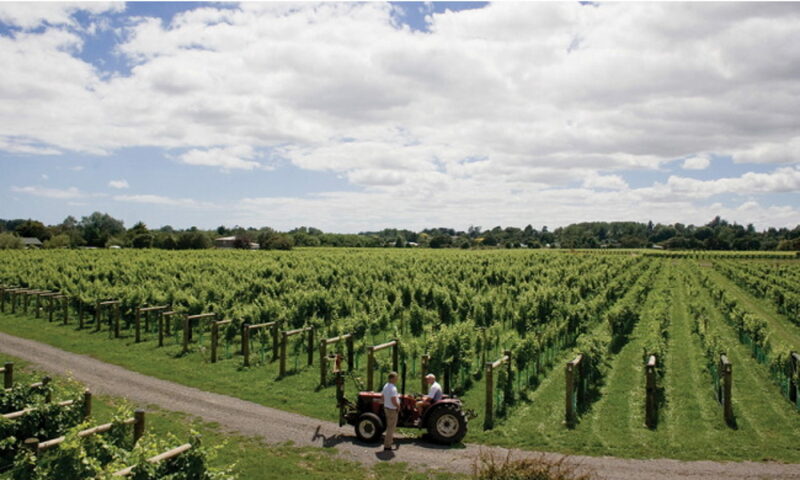 The Joseph Soler Vineyard currently produces 15 grape varieties and supplies to all three company wineries, Villa Maria Estate (Auckland), Vidal (Hawkes Bay), and Esk Valley (Hawkes Bay). Over the next five to seven years, Jonathan will take the lead role in bringing the entire Joseph Soler Vineyard (44 hectares remaining) into organic production. Seeing the opportunities in viticulture, he spent several years growing grapes on Waiheke Island before migrating south to the Hawkes Bay, to work for CJ Pask and Ngatarawa wineries. He was later employed by Villa Maria to manage the organic vineyard, Joseph Soler. 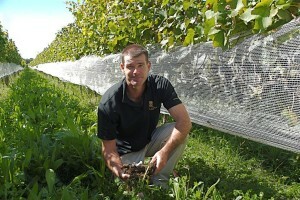 Jono is the vice president of the NZ Organic Winegrowers Association. Jono’s roadshow show was a polished display of art, chemistry, showmanship combined with facts and superb organic wines. What was of great interest was the breadth of Jono’s knowledge of viticulture, winemaking and the impacts and trends he is apart of at Villa Maria. This includes moving the Joseph Soler Vineyard from a traditional vineyard to organic, about 5% of total Villa Maria wine production, and the biodynamic trends Villa Maria have set in the wine industry. Passionate about his role at Villa Maria, Jono expressed the impact that terroir has on vine growth and took his time in explaining in some detail how this has impacted on the various Villa Maria vineyards in all wine growing regions of New Zealand. The wines selected for the night showcased a small proportion of Villa Maria’s stable of wines. The quaffer, Gewürztraminer, was fairly typical of the varietal. The two Sauvignon Blancs again typical except the Templar very refined and is a likable type for those not as passionate about Sauv’s as some. Villa Maria is one of only a few vineyards to produce Verdelho in New Zealand. Another vineyard is Esk Valley, one of Villa Maria’s other brands. Jono then produced two barrel samples, a Chenin Blanc and a Merlot, which were both unfined and cloudy. For many members it was their first taste of barrel samples and a great way to understand the development of wine from barrel to bottle to glass to lips. A unique and a great touch to the night. The night wasn’t finished there. From Jono’s box of tricks he produced a beautiful Chenin Blanc sticky. Superb considering where it came from. After a wet summer in 2012 left the Chenin Blanc underdeveloped Jono left the grapes on the vine until May. By this time there was not a lot left to the grapes but wow what depth of flavour. Shame it was in such a small amount. Thanks Jono and Villa Maria. Want to find more about Villa Maria? Have a look at the playlist. The presenter for this Villa Maria tasting will be Jonathan (Jono) Hamlet of the Joseph Solar Vineyard (manager and viticulturist) in Hawkes Bay – he manages the organics programme for V M nationwide, and this tasting will concentrate on their organic portfolio. Amongst other achievements, Jono is the vice president of the NZ Organic Winegrowers Association. More detail next month. On offer will be a Gewürztraminer quaffer, then two wines from the Private Bin range, two Cellar Selections and two single vineyard wines, all organic offerings. In order to show some more ‘interesting’ varieties, Villa Maria will arrange for some barrel samples of wines produced from grapes from their organic vineyards i.e. 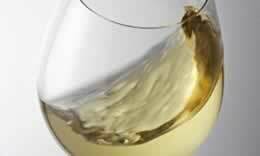 Chenin Blanc. They have over 15 varieties planted in their Hawkes Bay organic vineyard alone so this shouldn’t be a problem!